Visible Ink Press : Which superhero had a sidekick named Toro? Which superhero had a sidekick named Toro? Along with Sub-Mariner and Captain America, he was one of Marvel's most successful superheroes in the 1940s. He is actually an android, not a human. His superpowers involve his ability to manipulate fire. But he should not be confused with Johnny Storm of the Fantastic Four. The Human Torch was one of the "big three" heroes of Marvel (then known as Timely) Comics, along with Captain America and the Sub-Mariner--and one of the most popular Marvel superheroes of the 1940s. Like the Sub-Mariner, he was first seen on the newsstands in Marvel Comics #1, in late 1939. Historians believe that the Sub-Mariner came first and that the Torch was created by Carl Burgos as a counterpart to his friend Bill Everett's aquatic hero. Both artists worked in the Funnies Inc. sweatshop and were among several creators involved in packaging together the first of a new comic line for pulp publisher Martin Goodman. The comic, and particularly the Torch and Sub-Mariner characters, proved a hit, and Timely soon grew to become one of the era's biggest companies, eventually emerging as the Marvel Comics that readers know today. As the story in Marvel Comics #1 reveals, the Torch is an android created by Professor Phineas T. Horton, which accidentally bursts into flames when exposed to oxygen (due to a design flaw). Disappointed by his failure, Horton buries the poor creature in a glass tomb and sinks it in concrete. But when an explosion accidentally releases the Torch, he rampages through a nearby town, causing chaos wherever he goes. Befriended by a crook called Sardo, the Torch is lured into a life of crime until rescued by Horton, who has his own agenda. Seeing that the Torch can now control his flame, Horton plans to exploit the Torch's powers for his own gain. Disgusted by the professor's greed, the Torch heads off on his own, to right injustices wherever he encounters them; and he soon signs up as a member of the police department (adopting the alter ego Jim Hammond, though this temporary device is not well-remembered today), rushing to the scene of any crime or disaster. Although he had no tool or weapons to speak of, and his scant bodysuit costume disappeared when he ignited into flames, the Torch's persona as a red-hot flame intrigued readers. He could melt bullets shot his way, fly, and create ropes of flame and fireballs to subdue even the most dastardly ne'er-do-wells. In his Torch persona, the hero was unaffected by electricity and explosions, although the force of a powerful blast was known to knock him over. His number one vulnerability, of course, was water. In 1939, the superhero was still a very new concept and only nine heroes preceded the Torch and Sub-Mariner, many of them (Wonder Man, the Green Mask, the Masked Marvel) eminently forgettable. So Timely's pair made a massive impact. The Torch's regular spot in Marvel Mystery Comics (the new name for Marvel Comics) was soon joined by his own quarterly solo title, and as the United States entered World War II, the Axis-smashing Torch began to pop up elsewhere as well. Between 1939 and 1949, the Torch starred in almost 300 adventures, in such titles as All Winners, Daring, All-Select, Captain America, and Mystic Comics--almost tying Captain America for the greatest number of stories published for a 1940s Marvel hero. 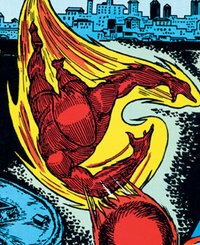 For Human Torch #1, Burgos created a junior sidekick for the hero (possibly inspired by the recent emergence of Robin in Detective Comics), a young counterpart called Toro, the Flaming Kid. Following the death of his parents in a train crash, Toro was adopted by a circus fire-eating act that had discovered that he could control fire and was unharmed by it. When the Torch happened upon him, they teamed up, and Toro eventually moved in with his mentor as his ward. The pair became inseparable for the rest of the strip's run. Toro later went on to join the Young Allies, who starred in twenty issues of their own comic as well as a lengthy run in Kid Komics. The war was a boost to Timely/Marvel's heroes and they were among the first to take the fight to the Axis powers. While the Torch never really developed any arch-enemies, he was constantly battling the Nazis and Japanese, in between rooting out spy rings and racketeers. Another innovative feature of the Human Torch strip was his many battles with his co-star and rival the Sub-Mariner. The first of these appeared in Marvel Mystery Comics #8. The pair's longest battle stretched to an astonishing sixty pages (in Human Torch #5) and ranged across the whole planet, taking in Axis plots and vast warring armies. Burgos, Everett, and their Funnies Inc. colleagues would hole themselves up in hotel rooms and work for days on end, churning out these mammoth tales, to meet their fans' insatiable demand. While sometimes crude, these epics have an incredible energy and dynamism to them that still excites today. Burgos was drafted, in 1942, and other creators were brought in to take over his work, including artists Harry Sahle and Don Rico and a promising young writer named Mickey Spillane. After the war, Burgos contributed a few new tales but the strip was in decline and, in mid-1949, Human Torch Comics suffered the indignity of being transformed into Love Tales. Not even the late innovation of replacing Toro with a female assistant--the light ray-emitting Sun Girl--could halt the sudden collapse of the superhero market. Marvel concentrated on romance, war, and horror comics until the mid-1950s, when they evidently felt that the time was right for a revival of their heroic stars. Young Men #24 (December 1953) starred all the big three, with the Torch as cover star, and reintroduced the heroes to a new audience. The Torch, it seems, had been covered by a flame-retardant solution and buried in the desert by "the crime boss" until he was freed by a nuclear test blast five years later. Toro had been captured and brainwashed by the Koreans, and the Torch's first task was to free him from their control. Together again at last, the pair took up from where they had left off, tackling organized crime (and bashing the occasional "red" in the process). Their resurrection led to the revival of the Torch's own comic and to appearances--many by Burgos--in further issues of Young Men, Sub-Mariner, Captain America, and Men's Adventures, but within a year the Torch was canceled once again. When, in 1961, fans next discovered a comic starring the Human Torch on the stands (Fantastic Four #1), it was a totally different Torch, Johnny Storm. Following DC Comics' success with its new superhero line, Martin Goodman decided that the time was right for his own company to re-enter the genre, and when writer Stan Lee and artist Jack Kirby set about dreaming up a new title, someone clearly remembered the first Torch's success. Although Johnny Storm is an integral member of the Fantastic Four, he has rarely enjoyed solo success; his main ventures outside the group have been an early run in Strange Tales (issues #101-#134) in the early 1960s (one episode of which was drawn by Burgos), and a solo series targeted at young readers that flared up in 2003. In 2011, Johnny Storm was seemingly killed off, but it is surely inevitable that he will eventually turn up alive. Fans had not quite seen the last of the original Human Torch and Toro, however. The first Torch reappeared to fight the new version in the 1966 Fantastic Four Annual, having been reactivated by the Mad Thinker, while Toro made an appearance in Sub-Mariner #14. Sadly, both died. However, over in the Avengers comic, the evil robot Ultron acquired the Torch's remains and took them off to Prof. Horton (who had actually been killed off back in 1939; but clearly, no one at Marvel remembered that). Horton then managed to fix the flaw that had caused his creation to self-immolate. Using the new, improved android, Ultron fashioned a new superbeing--the Vision--who soon became an Avenger, as chronicled in Avengers #57 and #58 (though his synthetic lineage was not fully revealed until #135, as part of a time-travel saga that also brought the original Torch and his later self face-to-face). Writer and comics historian Roy Thomas always had a fondness for the first Torch, and in 1975 created The Invaders to recount further wartime adventures of the Timely Comics "big three" (including Captain America and Sub-Mariner, and adding Toro and Captain America's sidekick Bucky to the group). That title's cancellation, in 1979, might have marked the last hurrah for the first Torch. But one should never say never where marketable properties are concerned, and by the late 1980s continuity had been revised so that the original Torch had not been transformed into the Vision and could fly again, first as a member of the West Coast Avengers and later with the Heroes for Hire. Writer Kurt Busiek further amended continuity in Avengers Forever (1998-1999), establishing that due to a time paradox, the Vision had indeed been constructed from the original Torch's body, yet the Torch himself continued to exist as a separate being. The Torch joined the contemporary team, the New Invaders, but sacrificed his life to save his teammates. Toro was resurrected by the all-powerful Cosmic Cube in Avengers/Invaders #12 (August 2009). In the limited series The Torch (2009-2010), the Mad Thinker resurrects the original Human Torch, who is reunited with Toro. Thus it was, that the original Human Torch, one of the very first "Marvels," triumphantly returned to the pages of Marvel Comics in time for the seventieth anniversary of both the company and his own debut in Marvel Comics #1.